Over the years I have owned many many cartridges, Shure V15, Linn Asak/Asaka, Ortofon, Rega, Linn K9, Satin etc etc and this Denon walks all over any of them. Its smooth but highly detailed, the mid range area is to die for, absolutely no aggression and the bass, though light in texture is as deep as any before. Over all then damn fantastic! On top of all this praise I have to add that its also the finest tracker I have ever known it even tracks the Telarc 1812 canon shots and yes even the last one!!!! In fact it has never NOT tracked it and yet non of my previous cartridges ever did remotely! I have used this cartridge now for over 4 years on a LP12 and in an early but perfect Linn Akito arm and it just performs perfectly and I cannot imagine it being any better in a more expensive arm! My only moan is that i had to buy a separate phono stage because there one in my then and come to think of it my present preamp didn't have one. I bought a Project Tunebox 11 and that copes totally well with the low output and the duet performes really well but I am now looking to upgrade the Project as I feel that it might well be letting my wonderful Denon down. What I will replace it with when it eventually dies concerns me massively as the 304 has now been discontinued and has not yet been replaced with anything, any ideas anyone? At £429-99 it was never a cheap cartridge so I will be looking at cartridges costing around £500 to £600 which should tell of the quality of the 304 but lets hope that Denon bring out a new replacement by the time I get to that stage. Dark and bassy sounding out of the box compared to Denon 103R. No sparkle and very little excitement. I will give it a month or two and if no improvement it will go to Ebay. Very happy with this replacement for my venerable DL-303. Used in Technics 1200 TT with great success (12Gm effective mass arm). Sharply etched dynamics and detail, but never strident. Excellent stable stereo image with impressive 3D depth on many recording- voices step into the room with you. Bliss with AKG 701 headphones given new discoveries with every favourite LP. Minor issue with surface noise occasionally, but easy to overlook given virtues (many of my LP's are 40+ years old). Low voltage output may be a bother, but no issue with Denon AU310 transformer and valve RIAA amplifier (5mV input). Directly compared with Ortofon HM30 (close competitor, but Denon has just a little more detail) and some classic MM cartridges (AKG PS8, ADC XLM, and Grace F8C). I keep settling on the DL-304 as my preferred cartridge. Hunt around for best price and take advantage of exchange rate movements for a real bargain. Highly recommended. Wide soundstage , detail , separation , vocals ,delicate touches are there. you can hear the whole musical picture. Handles ALL types of music & pressing sound quality. Amazing price! Low Output so step up transformer or phono stage is a must. I am using the Dnyavector d75 mk 2. A bit lean on bass but I have big speakers so I am getting a firm sound & my Dubplates have never sounded better. Audiophile snobbery because it is not over £1000 & "It is made by Denon . They make mini systems dont they?" This is the best cartridge I have ever used . At long last a needle that can play all types of pressing/sound quality/music genre etc! Albums you thought sounded duff sound fantastic , it betters both the sumiko blue point & audio technicha oc9 which cost more. In my Gyrodec/Rega Rb300 I am getting a taste of THAT sound!!!! If I heard this 15 years ago I wouldn't have bought so many cds!! Voices, micro-details, extreme dynamics, still very neutral, comparably low price. We are probably talking 10 x its price to really have any substantial achievements. The Denon DLS1 could be an alternative but I have not ha a chance to listen to it. Very low output construction. Likes middle-mass arms and upwards. The Ittok seems to love it. Can be hard to get. Price vary a lot. Mounted on a Linn LP12/Ittok/Lingo. Signal fed through a Denon 301 LC step-up transformer, Ming Da 767 RD RIAA-tube pre-amp/Krell KAV 250P/A and Monitor Audio speakers. For comparison: a Jungson SACD tube player and Marantz/DAC-inthebox2 CD player. Rock steady imaging. Voices sound fantastic. Extreme micro-detail level in music. No problem with surface noise in my set-up. On the contrary a very quiet, "dark" back-ground. The Linn and the Denon seems to love each other. 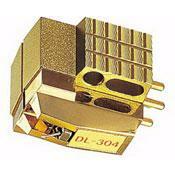 No Linn cartridge comes near in ANY area regardless of price, to the Denon 304. Also, the Denon seems to be very neutral. No particular colouring or emphasis on parts of the spectrum. The bass could sound a bit low at times but perhaps the sheer clarity of the sound made it sound a bit more slim than usual. The Denon (together with the Linn) beats the Marantz in all "HiFi"-areas and is slightly better than the Jungson on 3-D imaging. When it comes to sheer musical involvement, I have heared nothing quite like it, regardless of price. Beware of the low output though = 0.18 mV. Most so called MC-inputs can´t handle it. You need a transformer or a good head-amp. The Denon 301 adds very little character of its own and works fine in my set-up. It is still really the cartridge you are listening to. Various Shure cartridges, Nagaoka, Ortofon, Supex. Linn K18II etc. I love this cartridge. The strongest suit is its fabulous midband. It almost seems to spotlight vocals. Filigree detailing is superb and if you was more of those moments when you just look up at your stereo and go F*%K that sounds brilliant, buy one of these.